Posted October 30th, 2012 by David Porter & filed under Case Studies. Based in Manchester, SpeedQuote is an e-commerce company ‘designed by printers for printers and print buyers’. Their internet-based software helps printers to generate new business and simplifies the quoting process. It brings together printers, print-buyers and print management companies across the UK and beyond. Director Mike McLain explained that the original idea was ‘born out of spending so much time calculating print estimates manually and the associated challenges like training your sales team to produce accurate print quotes’. With SpeedQuote users tap into an online instant facility which provides instant, accurate prices in seconds. E-commerce and customer-facing websites are fully integrated, lead generation from their national site printbuyer.com, marketing tools and some powerful print management software is available. Testimonials from some of their customers speak of the expertise of the company and the benefits they have drawn from using the system. Ian Drew from 354 said: ‘we now reach a wider market quicker … and the day of waiting for prices has gone’. Rob Botterill of the Howard Smith Paper Group said ‘in SpeedQuote you can import your paper prices, have them updated automatically (optional) and order paper directly from the system saving us all time’. It’s the saving of time that is money to all companies, but in a fiercely competitive market like print and paper, up-to-date pricing, waste reduction and speed of transactions are crucial. Michael Whiteley of Chaos Laboratory Ltd added, ‘we are all looking at reducing waste and at the same time providing better information more quickly. 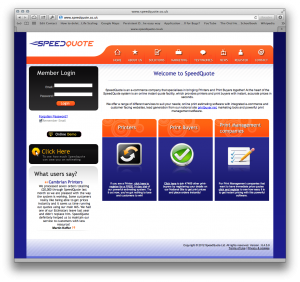 SpeedQuote really helps buyers and printers save time’. Trade-Print.com’s Simon Toft summed it up when he stated that ‘SpeedQuote is literally the backbone of our company’. In the digital era, data is king and speed of service is a given. In the current economic climate, it’s a necessity which gives the edge to those businesses constantly modifying and improving speed, accuracy, reliability and quality. MailBigFile specialises in fast data transmission and the hook up between SpeedQuote and MBF was always a mutually beneficial and natural progression. So how did they hook up with MailBigFile about 18 months ago? Mike said, ‘We were looking for a simple/powerful solution to handle file transfer. We tried connecting to FTP sites and had some success – but the ease and simplicity of MailBigFile made it easy to standardize on that solution’. We asked how has the relationship with MBF developed and changed? The response was that MBF has been ‘very helpful in developing their solution to meet the needs of our Print Buyers. They helped us deliver a solution where a buyer uploads the files once and many suppliers are notified which is ideal for inquiries’. They have dealt most with Steve and Lee. And finally, how did they see the MBF services evolving in the future to meet SpeedQuote’s changing demands? Mike made it clear that all print jobs require customer artwork – nearly 100% now comes electronically. He said, ‘Ideally going forward MBF would allow the Printer to edit/change the file and the buyer have the ability to view and approve those changes’. That’s MBF and these Blogs, moving forward. Have you got any suggestions? ideas? thoughts? Let us know.